A 42-year-old man was admitted with insidious onset, progressive weakness of left upper and lower extremities of 6 months duration. Neurological examination revealed left spastic hemiparesis with grade 3 power with brisk deep tendon reflexes. 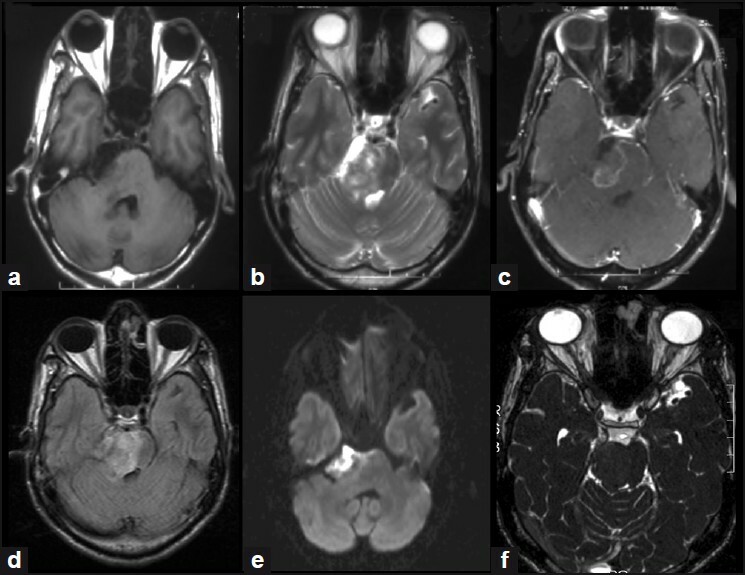 Magnetic resonance imaging (MRI) brain revealed a lesion in right cerebellopontine angle, hypointense on T1-weighted images, hyperintense on T2-weighted images, not suppressed on FLAIR and showing restriction on diffusion-weighted imaging [Figure 1]. On administration of gadolinium, a thin rim of peripheral enhancement was evident. The tumor had multiple irregular, lobulated outpouchings into the brainstem. The imaging findings were consistent with the diagnosis of epidermoid cyst. A right retrosigmoid suboccipital craniectomy was performed in the lateral decubitus position. The tumor was pearly white in color, flaky in consistency and multilobulated with a poor plane from the brainstem. A near total excision of the tumor was done, as part of the capsule adherent to the brainstem could not be removed. Postoperative recovery was uneventful. 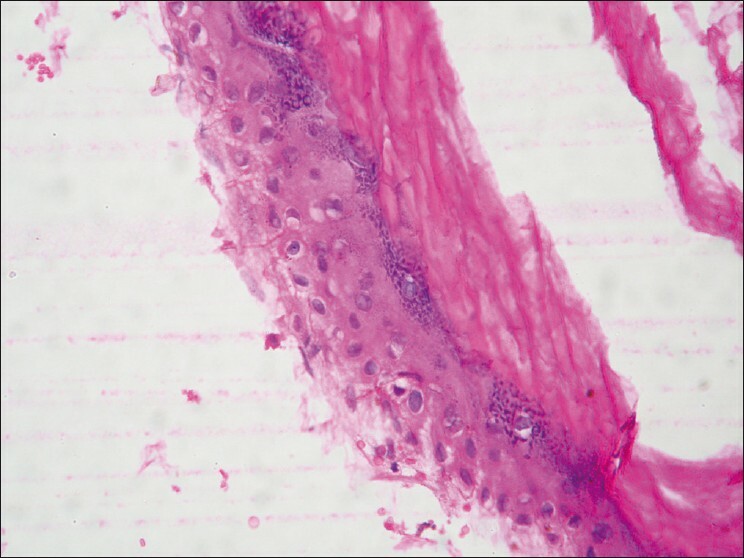 Histological examination revealed the presence of keratin flakes with squamous epithelial lining consistent with the diagnosis of epidermoid cyst [Figure 2]. Follow-up at 3 months revealed minimal improvement in his left-sided weakness. Intracranial epidermoids are congenital ectodermal inclusion cysts, most commonly located in the cerebellopontine angle accounting for 9% of all tumors in the cerebellopontine angle. Epidermoid tumors cause molding of surrounding neural structures, burrow into available space, and engulf critical neurovascular structures without causing mass effect. Cerebellopontine angle epidermoids frequently present with hearing loss, tinnitus, facial nerve palsy, or irritative symptoms in the form of trigeminal neuralgia or hemifacial spasm. , Long tract signs are an uncommon initial presentation in cerebellopontine angle epidermoids. Presence of hemiparesis is considered to be a marker of clinical aggressiveness in pineal region epidermoids. The possible explanations proposed are that large epidermoid cysts of the pineal region may cause sufficient mass effect to compress the internal capsule or cerebral peduncle resulting in weakness; the cyst may undergo malignant degeneration with the acquisition of invasive characteristics or the cyst may represent one subtype of a histologically heterogeneous mass that contains tissues of a clinically more malignant nature. In our case, the occurrence of hemiparesis as the presenting symptom in a cerebellopontine angle epidermoid is rare. There was no evidence of any malignant degeneration or histological heterogeneity to explain the presence of mass effect. The only plausible explanation is burrowing of the epidermoid cyst into the brainstem which itself is uncommon in this pathological entity. 1. Gao PY, Osborn AG, Smirniotopoulos JG, Harris CP. Radiologic-pathologic correlation: Epidermoid tumor of the cerebellopontine angle. Am J Neuroradiol 1992;13:863-72. 2. Tancredi A, Fiume D, Gazzeri G. Epidermoid cysts of the fourth ventricle: Very long follow up in 9 cases and review of the literature. Acta Neurochir (Wien) 2003;145:905-10. 3. Chu CK, Tseng HM, Young YH. Clinical presentation of posterior fossa epidermoid cysts. Eur Arch Otorhinolaryngol 2006;263:548-51. 4. DeSouza CE, DeSouza R, Costa SD, Sperling N, Yoon TH, Abdelhamid MM, et al. Cerebellopontine angle epidermoid cyst: A report on 30 cases. J Neurol Neurosurg Psychiatry 1989;52:986-90. 5. MacKay CI, Baeesa SS, Ventureyra EC. Epidermoid cysts of the pineal region. Child's Nerv Syst 1999;15:170-8.